the waterfront that are superb locations for landscape and seascape photography. Most people go here for the sunsets, but sunrise is also good for pointing away from the sun to show how the morning light illuminates the bridges and Mountains of Marin County. 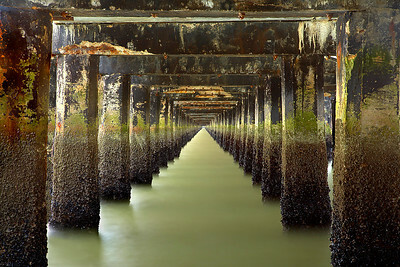 This view underneath the Berkeley pier was taken at low tide so that the mussels and dark seaweed can be seen. Waves kept splashing salt spray onto the filters. So it took about 20 minutes of trying to get the best image. And I had to wait about 1 month for overall light and tidal conditions to be right. Image #1 of the Berkeley Pier. This wide angle view extends from Angel Island on the right to the Presidio on the left. Alcatraz island is straight ahead. (From WikiPedia:) This pier as constructed extended three and a half miles into the San Francisco Bay from the end of University Avenue, but is today approximately two and a half miles (4.10 km) in length; however, only the first 3000 ft (0.9 km) are maintained and open to the public. 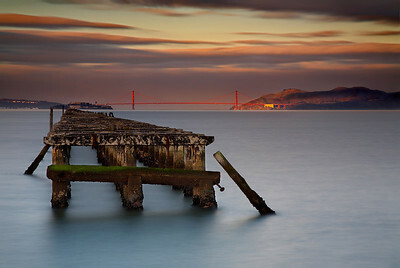 It was constructed in 1926 to provide a deep water landing for an auto ferry to the Hyde Street Pier in San Francisco. 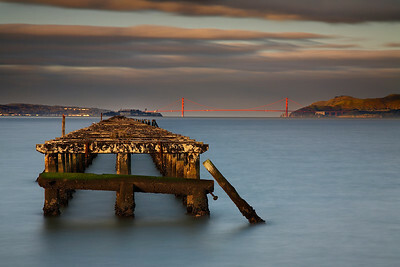 Image #2 of the Berkeley Pier. The sun came though an opening in the clouds, spotlighting the bridge and hills. Alcatraz island is at the end of the pier. A long exposure was used (hence the dark ND 8 filter and F22), in order to soften the chaotic water so as not to distract from the main elements of the photograph. 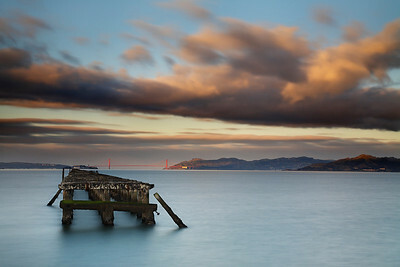 Image #3 of the Berkeley Pier. Here, the light just illuminated the pier; making it stand out as much as the bridge. The ND 8 filter really helped me get the longest exposure possible to keep the water smooth even in the sunlight.